BIG things are happening! 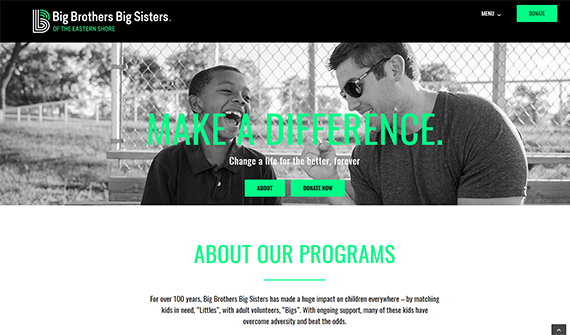 Vantage Point Solutions Group was honored to work with Big Brothers Big Sisters of the Eastern Shore on their new website. The new website for Big Brothers Big Sisters of the Eastern Shore brings a modern look to the program’s offerings and is easy to navigate and mobile friendly. For over 100 years, Big Brothers Big Sisters has made a huge impact on children everywhere – by matching kids in need, “Littles”, with adult volunteers, “Bigs”. With ongoing support, many of these kids have overcome adversity and beat the odds.